Our grocery store has premium products. Adrianna: My my, this has been a busy week. After teaching class and having our last Chinese class for the semester, we decided it was officially the last week we could do our Christmas shopping before the big holiday. Things started out uneventfully at our grocery store a few days ago. I found a pair of red slippers and some Christmas socks to put me in the spirit of the season, and Spenser continued to find more…interesting things. Too popular! TOO POPULAR! A Saturday at the Luoho border crossing. We wanted to go to Hong Kong, but we first had to tackle the border crossing. When we previously went to HK, we went on a Friday in the mid-afternoon and we got through in five minutes. Apparently, going through on the Saturday before Christmas is the ABSOLUTE WORST TIME YOU COULD GO! We initially tried our closest border, the Yantian crossing, but when we got there there were six tour buses dropping off their tour groups to go through the checkpoint all at the same time. 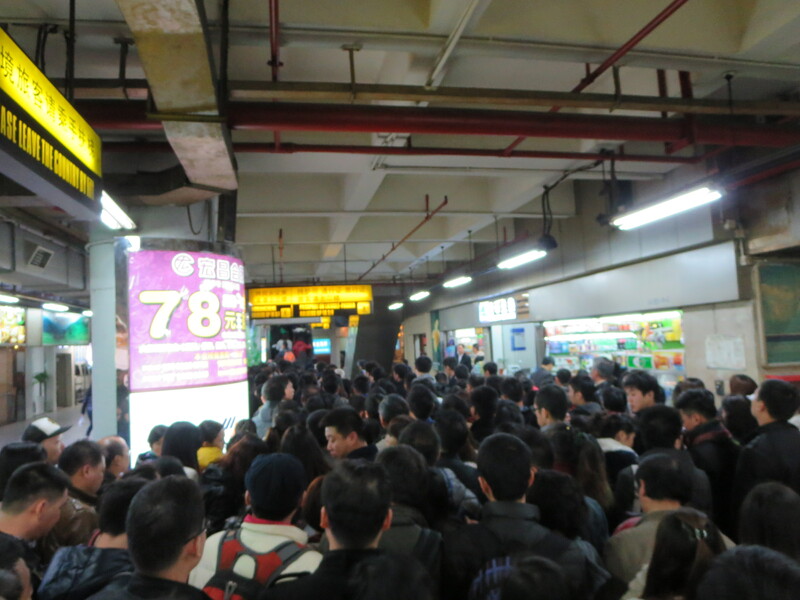 We thought that was too crowded for our tastes and we would try the Luoho crossing instead. We were so foolish. The food was delicious and the margaritas were some of the best I had in a very long time. I had missed Mexican food so much. We get decent pizza and burgers in Shenzhen, but Mexican food is, for some reason, the hardest cuisine to get right here. So yes, this meal was a real treat. After we were finally full, we took a trip across the bay to Kowloon to go shopping! Spenser here to complete this little blurb: We’ve been to Kowloon before (we stayed there during our last HK excursion), and we were pretty much trying to duplicate that experience. We were not successful. We went to the Chungking Mansions (recently featured in a BBC article), but the rooms were all booked up. Why, you ask? Because of a vast–and unanticipated–Christmas crowd that was flooding the streets of the Fragrant Bay. Rooms were pretty much all occupied OR going for about thrice the price we paid last time. We decided to skip the sketchy hostel and instead headed to the Jade Market to do some shopping. Sitting in the Jade Market. She was an old poodle. We got there, had a little snack, and began. Usually, I can get my Christmas shopping done in no time. I’ve got an eye for gifts, and just the right amount of impulse control to buy stuff randomly. This was not my day. After about 20 minutes of searching for gifts for Adrianna, she called me and told me that she had found everything for me. Great. No pressure here. 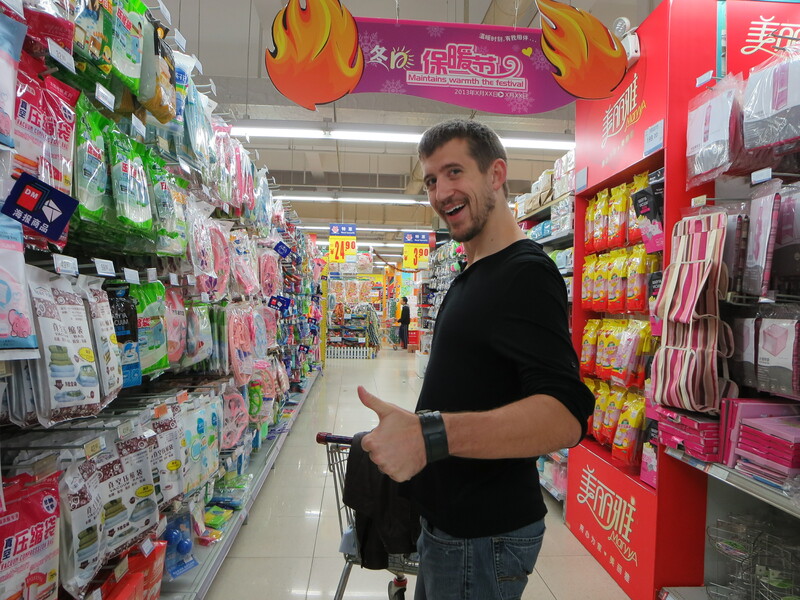 (Adrianna note: It’s really easy to shop for Spenser in China because he loves anything to do with China. Shopping was awesome.) In the end, I found a few things, but I still am not satisfied. As an aside, Adrianna claims that she like them, but I’m not entirely sure she isn’t sparing my feelings. It was getting late, so we called it a night and began the long journey home. 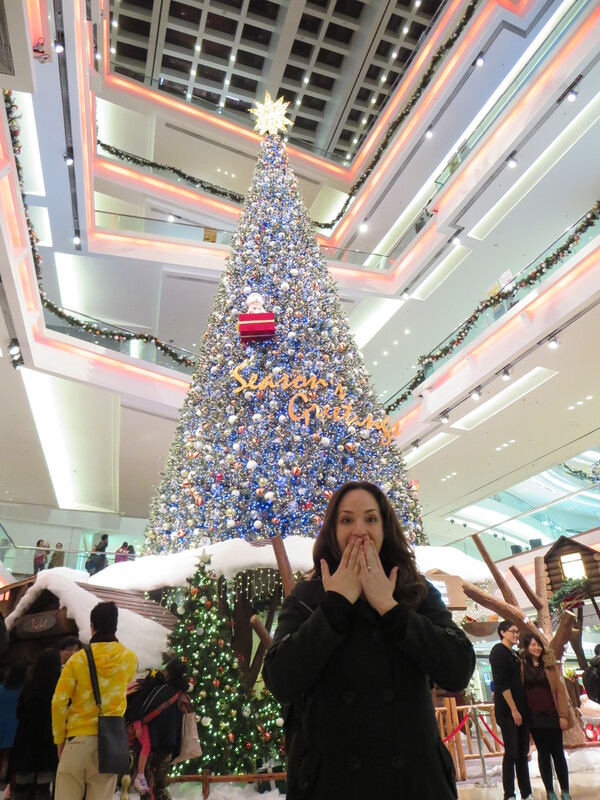 To exit the metro, we had to go through this mall with a giant Christmas tree. Adrianna was excited to see it. We hopped on the last subway to the border crossing and shot right through the lines. Apparently, it’s much easier to be a foreigner leaving Hong Kong than it is to be a foreigner entering. We snagged a cab and got home later than we had hoped. Alas, Christmas shopping wasn’t over (drat). We forget to buy gifts for Sahal and Kane, our co-english teachers at Shenzhen Foreign Language School, as well as out tutoring families. So we headed into the pit of doom: Dongmen (东门). 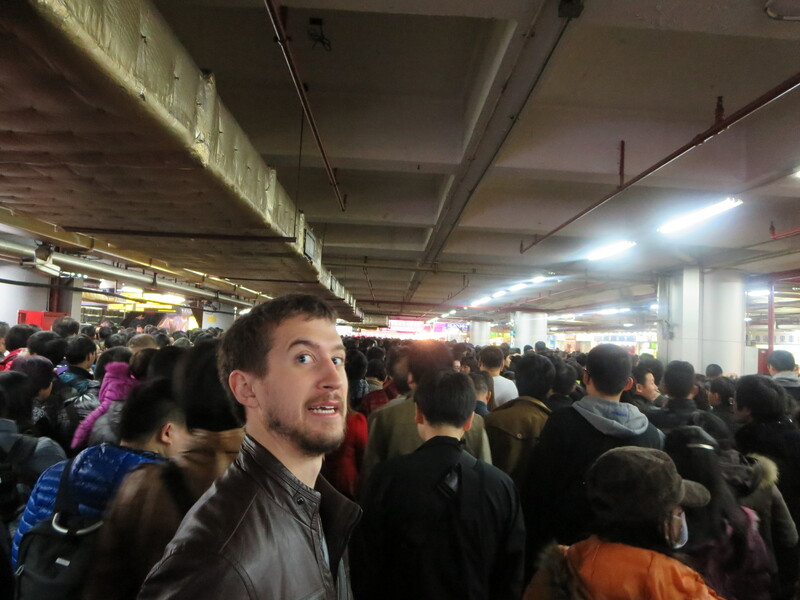 Dongmen during peak shopping hours is more or less like Black Friday in the states, except, you know, ALWAYS. It’s a large shopping district with dozens (probably over a hundred) of stores selling mostly clothes. They sell lots of other miscellany, but clothes are the sticking point. Visiting Dongmen is a hellish nightmare from which you can never escape. But we did it, for the good of Christmas, and managed to find appropriate gifts for all of our Yuletide needs. 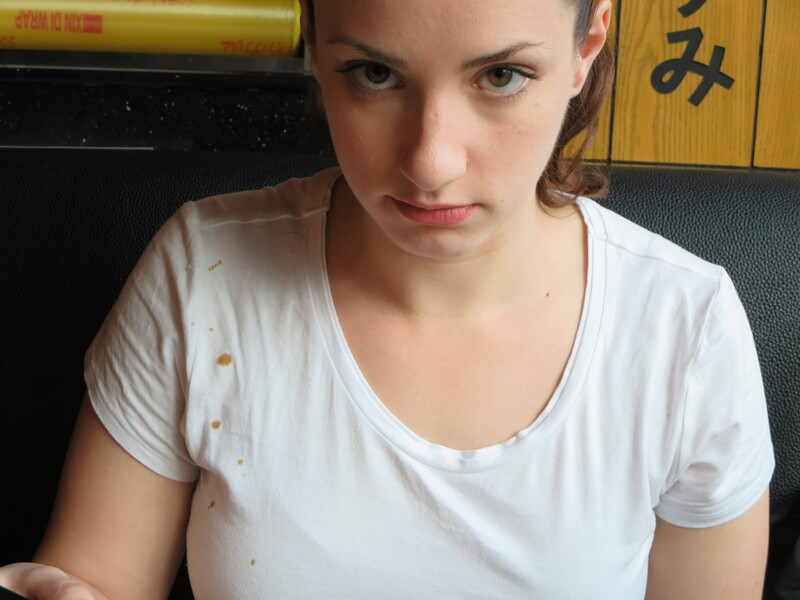 Adrianna also managed to splash soy sauce all over her shirt during lunch. HA!